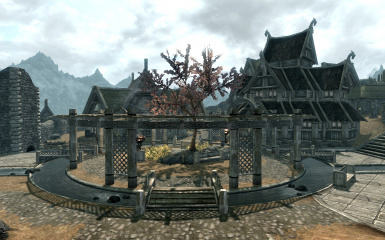 A mod to make the Gildergreen in Whiterun grow from the sapling back into a full tree over time. Takes approximately 6 months in-game time to grow from a sapling into a full adult. Danica asked you for sap from the Eldergleam to revive the dead Gildergreen in Whiterun. Instead, Maurice convinced you to bring back a sapling. All is now well in Whiterun, except for one small thing. That sapling deserves to grow into a nice big healthy proper replacement for the dead tree you helped get rid of. For those who followed the path of renewal in Blessings of Nature, but missed out on seeing the full size live tree in all its glory, this mod is for you. Now you don't have to choose the path of violence and destruction if you don't want to. Your sapling will now grow over the course of 6 in-game months from a tiny bud into a full bloom tree you and the city can be proud of. Kynareth shall smile on you for your kind ways. Skyrim Special Edition 1.1.47.0.8 or greater. Drop the archive into your Skyrim ModsBash Installers folder, then install as usual. Use the "Download with Manager" button on the Gildergreen Regrown page at Skyrim Nexus. The installer should take care of things from there. Drop the Gildergreen Regrown.esp and Gildergreen Regrown.bsa files into your Data folder. Uninstalling this mod after the vanilla sapling grows one stage but before the vanilla adult tree grows in will result in there being NO tree, not even the dead one. You'll need to allow things to run their course before removing the mod. Remove the two files from the Data folder. Compatible with Open Cities Skyrim. Does not overlap any changes in the Unofficial Skyrim Special Edition Patch. Should work with other Whiterun mods so long as they do not also touch the Gildergreen. Contains no modified vanilla scripts.